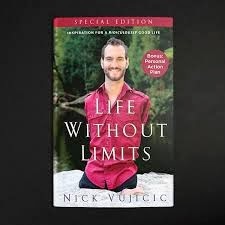 Nick Vujicic is a man born without any limbs, just a small feet. Yet, he overcome all this an become a well known motivation speaker and he has a lovely wife and child. Recently, he came to Malaysia as a speaker. I don't want to deny that I am somewhat frustrated in my life lately. Some of my close friends detected this through my FB postings. Since this is my personal blog also, it is good to denote what happen in my life so that one day, I can go back and look at it, and will see the silver lining in it. "Everything happens for a reason", in the case of Nick, if you think about it, it is really hard for him to remain optimistic in his initial pre-teen years. If he can remain happy and accepts his own physical conditions & limitation (for an average normal person, we will think that his condition is very disabling and will certainly pity him ALOT), how much so for those well-bodied people out there who despair just because he/she is not pretty enough, smart enough, rich enough, tall enough or even not having a boyfriend/girlfriend. His physical condition is his solid testament that hope, faith, love can change lives for the better. I think his initial problems were much bigger than my personal dilemmas & frustrations, yet he manage to overcome it. And his book is a retelling of his story. Yet, he is contented. And even managed to find the love of his life (the wife is quite good looking), even though he did not think any woman would want him before. Well, i think their love story would be a subject for another new book?? Carpe Diem! Seize The Day and live life to the fullest. P.S I only read thru Chapter 1 of his book today, when I finish maybe I will write a review on it. Always look up into him. Whenever we are unable to do something or failed to do something always think of him. If he can do it, why cant we? @lonely, still reading thru it.